French for under vacuum and pronounced "soo-veed", sous vide is a method of cooking that heats up food just enough to get the very best flavours out of whatever you're preparing. Proponents of sous vide say that it cooks things perfectly every single time, but we'd also like to add that it's also easy, stress-free and lets you eat delicious, healthy meals throughout the week. It's fair to say that sous vide opens up all manner of new dishes for you to make. But what exactly does it involve and how does it work? We've written up a handy guide to what you need to know and how to start cooking sous vide, along with some meal ideas just in time for the new spring season. What is sous vide and how does it work? Essentially, sous vide involves placing food in a plastic pouch or a glass jar, and then cooking in water for long durations at an accurately regulated temperature. The temperature is much lower than what you'll usually be used to, but it ensures that each item is cooked evenly, properly cooking the inside without overcooking the outside, locking in moisture in the process. When we use more traditional cooking methods, heat moves from the oven to a pan and then into the food, or the oven's glowing elements heat the air around the food and cooking it as a result. Both the air around the oven and metal in the pan are much hotter than the food, it has to be taken away at the right time to avoid under- or over-cooking. Are you ready for sous vide cooking? When cooking with water, however, we can raise the temperature just enough to get the food to the exact temperatures we want. When it's done, it can be taken out, or it can rest in the water until you're hungry without the need to constantly attend to the food as the food never gets hotter than the water. If you're throwing a dinner party, that means you can spend more time with your guests or focus on preparing other parts of the meal, making it a great option for those looking for more convenience in the kitchen. To get started, you'll need an immersion circulator, a handy little gadget that's used to set, adjust and control the device's timing and temperature. Some come with an accompanying app which you can control using your phone, while others feature recipe ideas and tutorials. Using a vacuum sealer guarantees the best results from your food, whether it's meat or vegetables you're preparing. Sealed in heavy-duty sous vide bags, FoodSaver's vacuum sealers lock in flavour and food without compromising on the quality and appearance of what you'll be eating later on, ensuring the best from what you seal in. Likewise, canning jars are a great option you're cooking something that needs to set, like custards and pâtés. Aside from these items, you'll need a large pan or pot to hold the water, and some clips to keep your bag of food in place while it cooks. Before you start, you need the proper items. 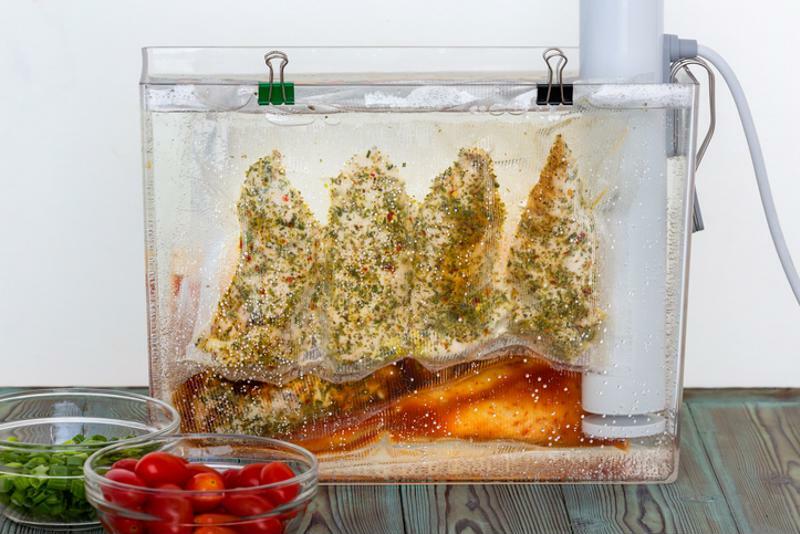 When preparing proteins to cook sous vide, you should always add oil to the bag; it will help to keep things moving in the bag – stopping food from getting caught in the seams, preserving its shape and preventing herbs and aromatics from sticking to the food. While you can cook multiple portions of food in one bag to save on cost and waste, don't be too over-zealous and fill the bag to bursting point. Creating space means portions won't stick together, preserving the shape for when you plate things up. Don't be too over-zealous and fill the bag to bursting point. With sous vide, we want things to be cooked as evenly as possible. If your bag starts floating when in the pan, it can result in uneven cooking. Placing a knife or spoon in the bag alongside the food before adding to the water can weigh it down and ensure the best results. If you're cooking fillets of fish, then they need to be handled with care once done. The last thing you want is your beautifully-prepared fish to fall apart when handling it with tongues. 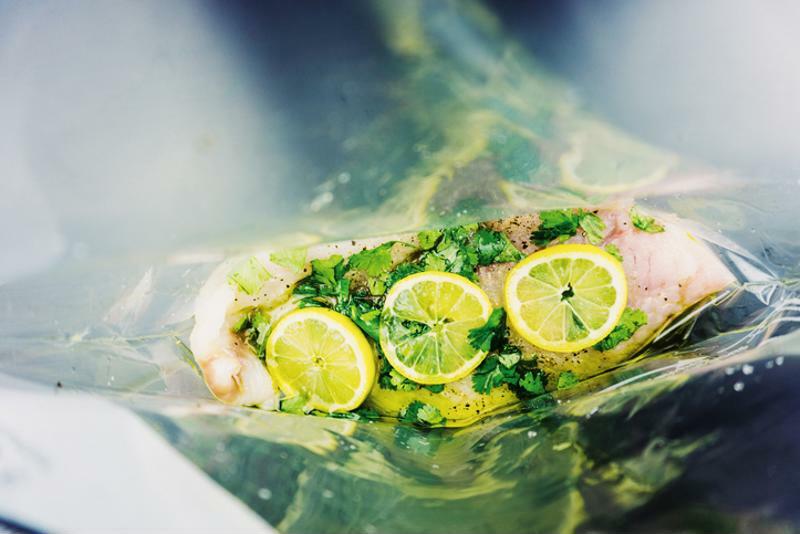 Use scissors to cut open the bag, get a plate and slide the fish from bag to plate, along with all those delicious herbs and aromatics. Bring some Asian flair to your springtime menu with these superb bowls of nourishment. Sticky and sweet, with plenty of nutritious veg on the side. A great al fresco treat, these tender lamb chops are sure to prove irresistible when the sun's out. A basil chimichurri adds plenty of powerful flavour, too. With the spring harvest soon to be in full swing, veg is ripe for picking right now. The world is your oyster (or aubergine perhaps?) when it comes to veg, but we've gone for this simple recipe that turns classic carrots into a delicious side. Add some sweetness to the season with this tangy, wonderfully-coloured rhubarb jam. With less sugar than regular jam recipes, you'll get all the flavour with less of the guilt! 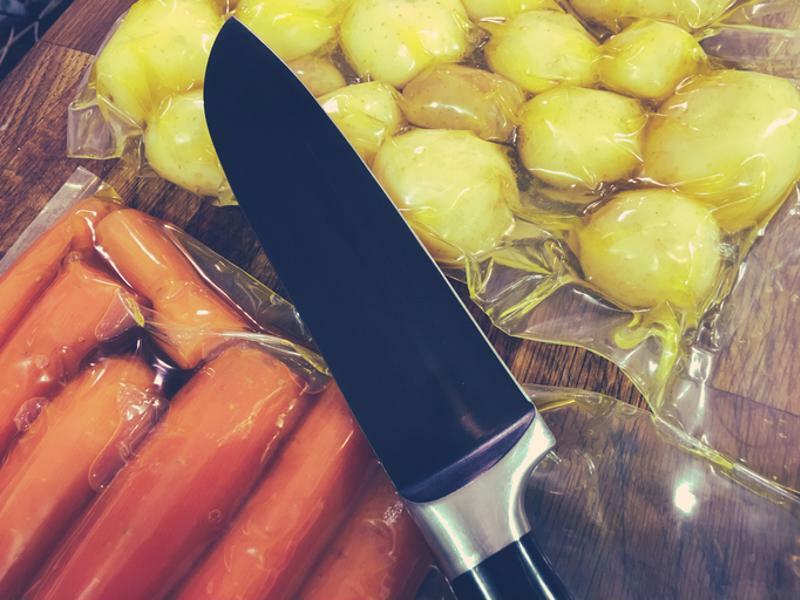 Don't forget, to help the food in this article last a little longer, they can all be stored using the FoodSaver vacuum sealing system to help you save money and reduce food waste. For more information about our innovative vacuum sealers, be sure to visit our homepage.